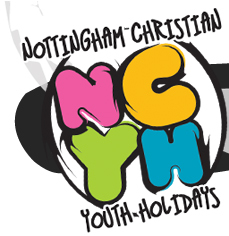 Nottingham Christian Youth Holidays have been operating since 1985 backed by 'Counties'. The holidays combine a lot of fun and relaxation with a helpful presentation of the Christian faith for young people. They are carefully supervised by responsible Christian adults (parents, youth leaders etc) from local churches. Each Leader is CRB checked to ensure that they have no history that would exclude them from working with children. The first NCYH Camp was held at Malton Bible College, Yorkshire in 1985. The Camps were pioneered by John and Brenda Wilkes, who worked for Counties, a Christian charity which supports local evangelists. The Camps were, and still are, the highlight of the year for many youngsters in the Nottingham area although Campers have come from far and wide (Derby, Leicester, Cambridge, Essex, Grimsby). The success of the Camps has been attributed to their fun format and the professionalism of the team, both underpinned by Biblical teaching and the gospel message.